Jakarta, 19 January 2018 – A coalition of Indonesian NGOs, dubbed the ‘Break Free From Coal’ coalition, has called for nine planned coal power plants to be dropped from the power supply plan due to concerns around massive supply overcapacity, which would lead to substantial financial and economic loss. 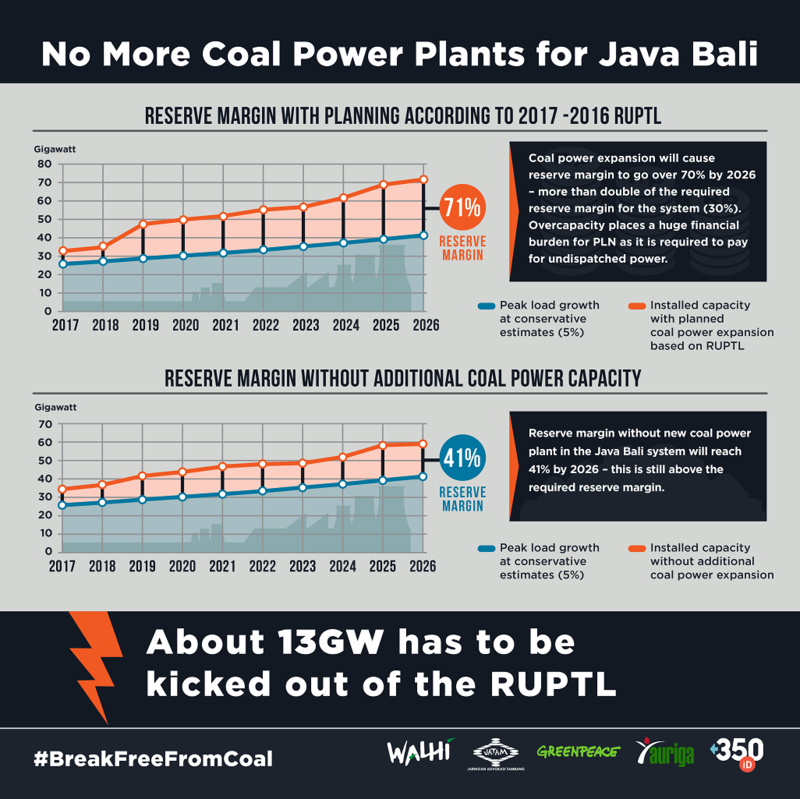 The analysis published by the coalition reveals the existing power supply plan (RUPTL 2017) has grossly overestimated demand growth and therefore has built an excess of 13 gigawatts into the Java Bali system. This would lead to a 71% surplus even at the most optimistic demand growth projections of 5% a year. 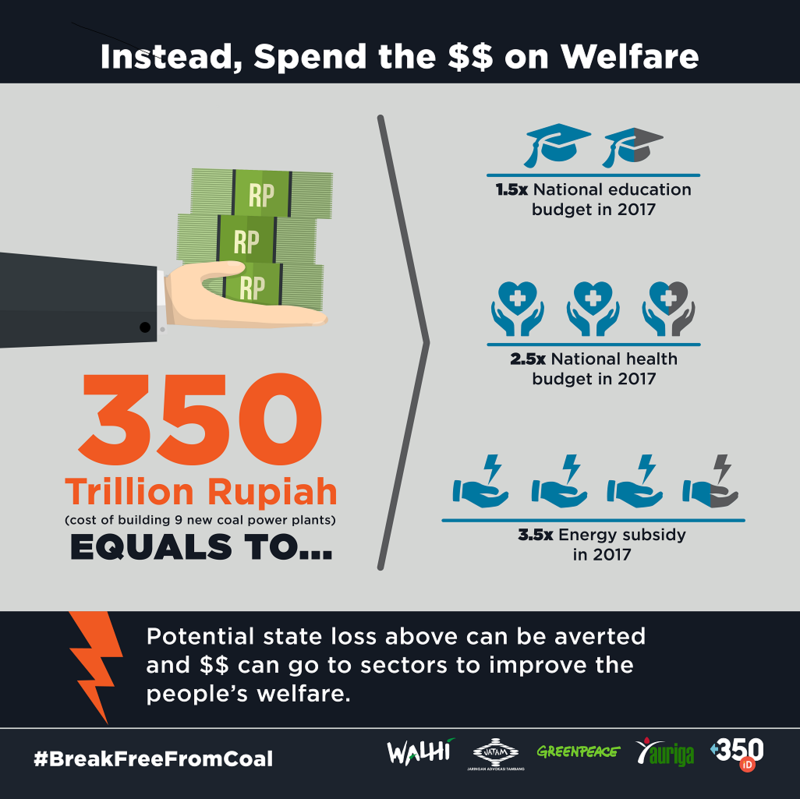 “Nine planned coal power projects, amounting to 13 gigawatts, need to be cut from the power supply plan in order for Indonesia to avoid massive financial and economic loss resulting from unnecessary capacity payments to power generators,” said Dwi Sawung from Friends of the Earth Indonesia (WALHI). 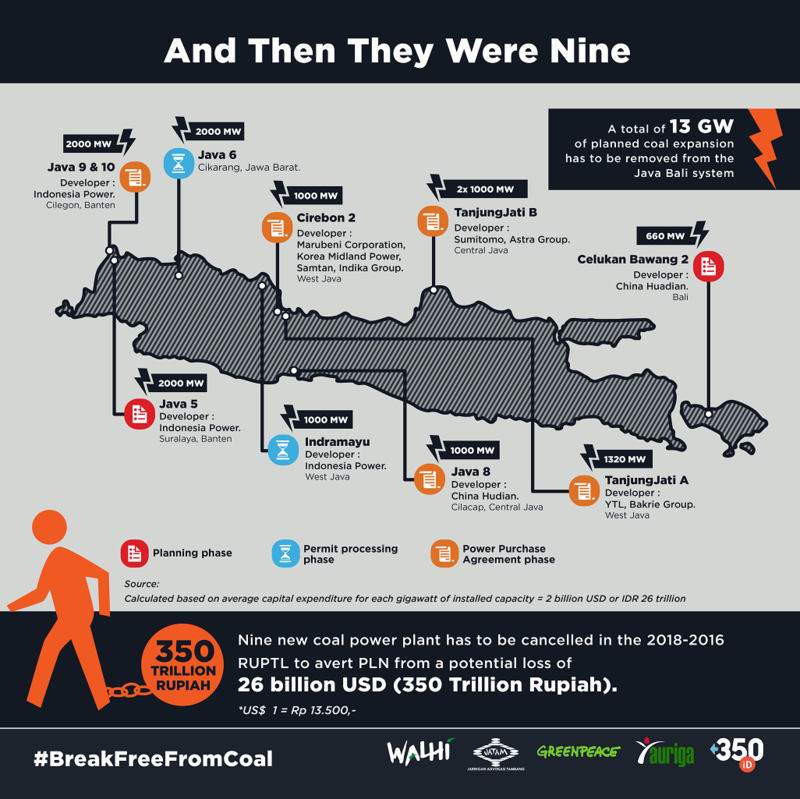 This situation is worsened by the fact Indonesia’s power system is heavily dependant on coal and therefore exposed to fluctuations in international coal price. Indonesia has set an ambitious plan to expand its electricity supply by more than 35 gigawatt in the next five years. According to the 2017 RUPTL, as much as 17 gigawatts of the stated expansion will be sourced from coal. The country’s state-owned utility, PLN, projected a demand growth of 7% in its 2017 power supply plan, based on the forecast 7.2% economic growth rate. In contrast, electricity sales have been below target, only reaching 4.4% in the last 5 years. Last year, Indonesia’s economic growth only reached 5.05%. The 2018 update of the power supply is due to be published in the first quarter of this year, following approval by the energy minister. “We can’t afford PLN to default; It will have devastating consequences for the economy. For a start, Indonesia’s credit rating will be affected as it is tied to PLN’s financial responsibilities. Indonesia will be forced to bail out its only utility,” added Mulaika. PLN is a public monopoly that has been given the constitutional mandate to generate, transmit and distribute electricity. Power generation has been liberalized in recent years, allowing for private developers and operators to sell electricity to PLN. However, PLN carries the burden of paying Independent Power Producers (IPP) at capacity for the entire PPA contract period of 30 years. 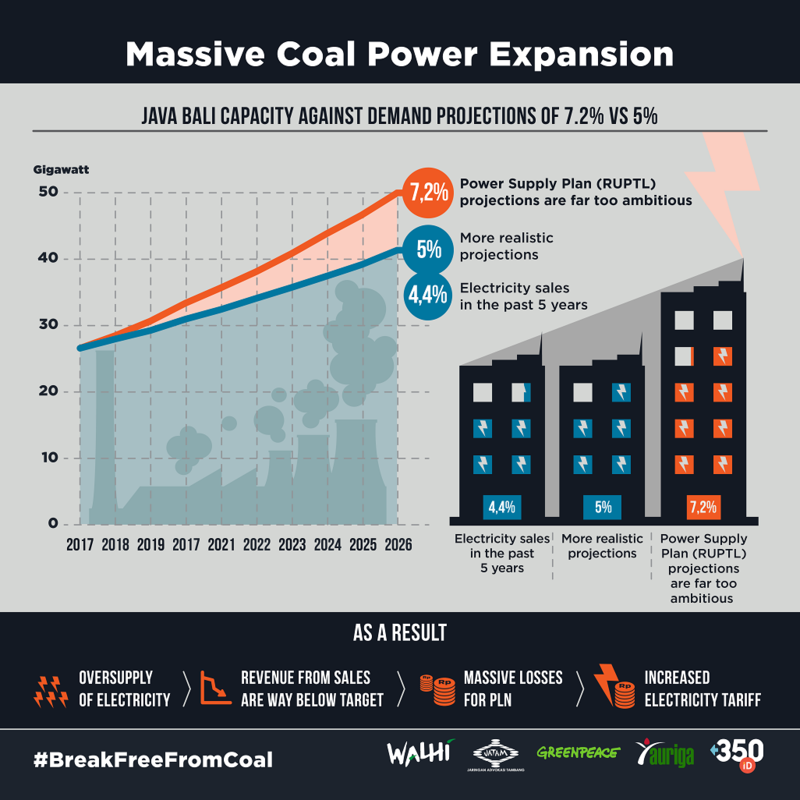 The planned coal power projects in question include two coal projects in the Banten province (Jawa 5, 2000 MW, Jawa 9&10, 2000 MW), four projects in West Java province (Jawa 6, 2000MW; Cirebon 2, 1000MW; Tanjung Jati A, 1320MW; Indramayu 2, 1000MW), two projects in Central Java province (Jawa 8, 1000MW, Tanjung Jati B, 2x1000MW) and one coal power expansion project in Bali (Celukan Bawang 2, 660 MW). These projects are at different stages of development, some of them have obtained early permits and others have progressed past the Power Purchase Agreement (PPA). Estimated financing needs for projects is estimated to be in the realm of US$26 billion. “This financing is likely to be state-backed, guaranteed by a business viability guarantee. And while this might seem trivial, PLN is facing a real risk of defaulting, so in the end, tax payers will have to shoulder the financial burden of repaying these loans,” said Hendrik Siregar, an energy researcher with AURIGA Nusantara.